Nokia today announced 3 new smartphones Nokia E7, Nokia C7 and Nokia C6 at Nokia World 2010 event in London. All these three smartphones are based on Nokia’s latest Symbian^3 operating system. We will discuss about Nokia C7 and Nokia C6 in later posts. Nokia E7 is called as the ultimate business smartphone with Microsoft Exchange ActiveSync on board. It provides direct, real-time and secure access to corporate email inboxes and other personal applications. 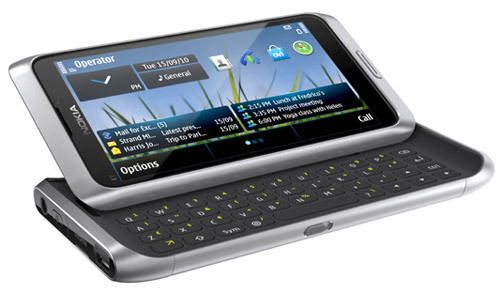 Nokia E7 comes with both touchscreen and QWERTY keypad. New Nokia E7 is equipped with a 4-inch touchscreen display featuring Nokia ClearBlack technology for improved outdoor visibility and a full keyboard. It has 8 MegaPixel camera which can record HD video. The new Nokia E7 is expected to be priced at 495 EUR or 638 USD and it is expected to hit the stores before the end of the year. complete features, only lack of 4G maybe? Well my E90 still productive until now.. sorry E90.. time to retired. Hope it launched immediately in Singapore with Starhub contract. i have got the phone for 2 days. It is quite very similar to the N97 but just bigger and a better software. i am quite astonished that reviews don`t even mention that. i am satisfied so far by the phone. the display is bright, the customisations are useful and the voice is clear on phoning. Unfortunately there are not as many supporting programs on the OVI stores. Reviewers often mention the difficulty in sliding out the phone, i disagree with that. you can see the video i posted on youtube, look for `romicom` and judge for yourself. WHERE IS THE FM TRANSMITTER? !